MINSK, Belarus, Nov. 3, 2017 /PRNewswire/ -- Mapbox, the mapping and location platform for developers, today announced that it is bringing on the deep learning team at MapData, a neural network-based map SDK team in Minsk, Belarus. The company also plans to open a new office in the High Tech Park in Minsk. The team in Minsk will be dedicated to supporting deep learning, computer vision and self-driving vehicles to complement the company's larger investments in autonomous driving and growing presence within the automotive industry. "Navigation apps have not innovated in years," said Eric Gundersen, CEO of Mapbox. "Drivers are looking at 2D maps on their phones like the old school atlas our parents had — we can do so much better. Front-facing cameras and navigation displays need to merge. 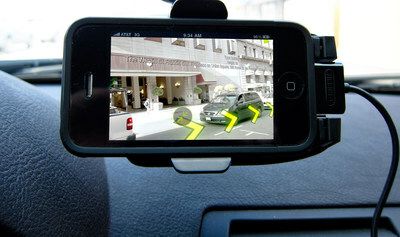 Drivers should see an augmented reality, with directions showing up in front of where they need to turn. Phones will be the heads-up displays of the future without the need for expensive hardware." "It's great to see how fruitful cooperation during the last one and a half years has grown into a new breathtaking project," said Alexander Matveenko, General Manager for Mapbox in Minsk. "My big dream was always to have and ride in a self-driving car. It's incredible that I get to be part of it and work on creating it." During the past few years, Minsk has been rapidly growing as an innovation hub. Mapbox has been successfully working with developers in the city for the past 18 months and felt the timing was right to expand its investment and activities in the area. "The President of Belarus is expanding benefits for the members of the High Tech Park area in Minsk and making it easier for companies to set up shop," said Denis Alienkov, Alienkov & Partners, who has been supporting Mapbox's activities in Minsk. Mapbox was initially introduced to Minsk by Yury Melnichek, the founder of Maps.me and lead investor AIMatters, who currently serves as an advisor to Mapbox. Melnichek saw potential in Mapbox's technology, not only for the automotive industry, but for the growth of Minsk as well. "The combination of technical talent and a really dedicated work ethic is going to drive a lot of startups here. I believe this is an ecosystem that is important for Mapbox to be a part of," said Melnichek. Mapbox is the location platform for developers. Mapbox provides a global map, real- time traffic, location search and navigation via our APIs and SDKs. Our services power industry leaders, including CNN, General Electric, IBM, Instacart, Lonely Planet, Mastercard, Snapchat, Tableau, and The Weather Channel. Mapbox is the foundation for other platforms, letting enterprises analyze their data, drone companies publish flyovers, friends find each other, real estate sites visualize properties, satellite companies process cloud-free imagery, and insurance companies track assets. Founded in 2010, Mapbox has over 290 employees with global locations in San Francisco, Washington, D.C., Bangalore, Berlin, Minsk, Shanghai, and Ayacucho. Learn more at mapbox.com, and follow our blog. Or follow us on Twitter.